Now before I continue I just want to make clear that I am quite fond of uncle Wayne. I think he’s a pretty amazing human being just trying to live life to the fullest. Painting his surrounding scenery with day-glo colors and switching on the black lights for all to see what he sees. I dig that. So don’t get the impression I don’t like the man. He’s the Pied Piper of Freakdom. I just think when you saturate the scene with so much you tend to lose sight of what’s show and what’s art. What makes Electric Würms different is that Steve Drozd is the main man on this trip. He sings on most of the tracks, while Wayne takes a backseat in the bass position. It fits him well, as the bass and drums play a big role in making this just as groovy as it is spacey. “I Could Only See Clouds” takes a little from the Lips’ Embryonic in its tribal beat and prominent bass, while Drozd sings in a space that was once occupied by Yes’ Jon Anderson. At times it’s hard to tell the difference between Drozd’s high register vocal and Coyne’s similar vocal sound which I guess it’s good for those that might not want to give this a try. What jumps out at me the most is that it’s not overwhelming. It’s not overblown and squelching out of the speakers. It’s subtle. Lulling, almost. It’s like a purple sea, slurping against a psychedelic schooner. “Futuristic Hallucination” swells with synths and bass. It moves and pulsates like a score to some long lost sci-fi film. Once again Electric Würms never get overwhelmed by themselves or lost in the moment, they remain at a cruising altitude throughout the psych-driven four minutes, melting right into “The Bat”. Drums come in with a steady groove as noises come in and out, moving from left to right. This song has more in common with Miles Davis than ELP or Yes, and that’s okay. If any artist could wear the progressive crown of the last 50 years it would certainly be Davis. “The Bat” is sonically attached to 2013s The Terror for sure, but in a toned-down way. Like a simplified version of anxiety. “Living” is a krautrock song to its core, complete with motorik beat and buzzing electronics coming to and fro. Vocals once again are more like another instrument than a centerpiece; merely a narrator to the music’s groove and foreboding vibe. “Transform!! !” is skronky funk and freak out fodder. This sounds like primo coked-out Miles at his best. The drums and bass dirty this track up to maximum psych funk filth. The album finishes up with an edited cover of Yes’ “Heart of the Sunrise”, which is fairly true to the original with the exception of its shortened length. 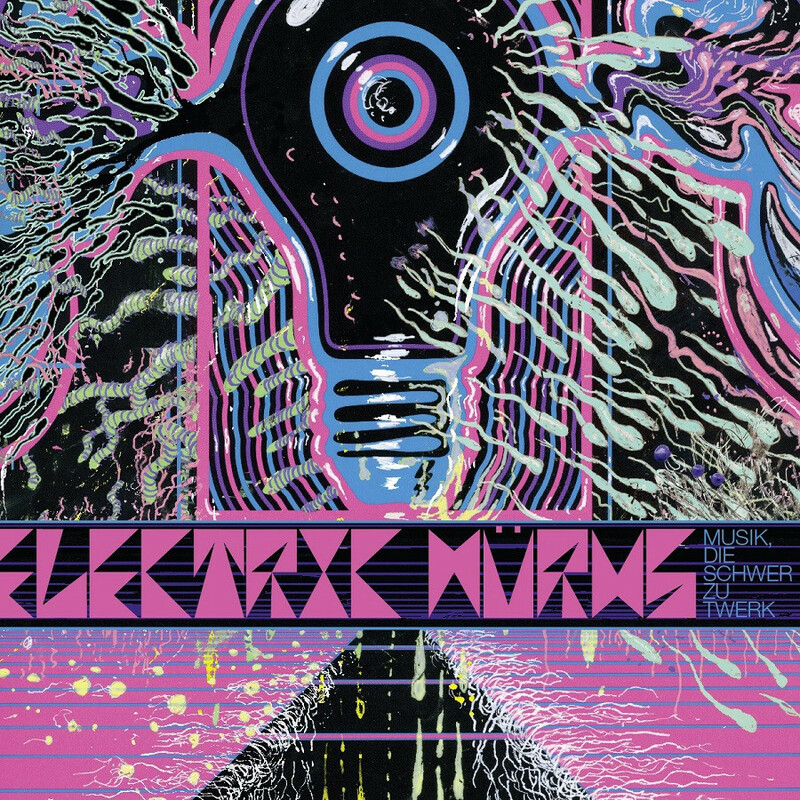 Musik, die Schwer zu Twerk is an album worthy of your time. It’s not going to win over folks that didn’t care much for the Flaming Lips before, but for those of us still willing to take that trip with Coyne and Drozd we’re going to have a great time. Put on some headphones and get lost for thirty minutes. Why? Why not? I know you’re not a fan, but you should give it a try. “Living” and “Transform” are worth the price of admission alone. The more I listen to it the more I like it. Sounds interesting. I enjoyed The Terror and this sounds like it has its roots there, maybe? But under 30 minutes? Isn’t that taking the piss a bit? There’s definitely some moments where you can hear The Terror in the underlying sound, but this album really does stand on its own. I think you might find a thing or two to really like about it. I know. 30 minutes?? I guess it’s a psych/prog EP then, if that actually exists.